Mr. Roman added “The opportunities to expand production and cash flow identified in the Feasibility Study are solid. Since taking over the project in 2009, management has increased the property wide mineralization tenfold. The “Base Case” scenario is an interim step to stabilize production, develop and train the workforce and generate positive returns for shareholders. As the Mineral Resource grows, we contemplate the continuation of our expansion plans as we envisioned in our PEA”. The Feasibility Study defines an 800 tpd underground mining operation. The Operation benefits from having all capital expenditures completed, including the process plant, related surface infrastructure and initial mine development. No further development capital is required to operate at 800 tpd. Mineralization at the Sugar Zone Mine has expanded significantly over the past eight years. Drilling completed in 2018 increased overall Indicated Mineral Resource and now incorporates the Sugar, Middle and Wolf Zones. The Mineral Reserve Estimate defined for the Feasibility Study represents an improvement to the overall tonnage and gold ounces, compared to the Indicated Mineral Resources prepared for the Preliminary Economic Assessment (“PEA”) completed in 2018. The figure below illustrates the Mineral Resource growth over the past eight years. The current mine plan represents a small portion of overall Mineral Resource potential. Of total operating costs, 70% is attributable to mining activities. The Feasibility Study uses contracted rates for mining and real operating data for the process plant. Management is confident in the basis of these estimates and its ability to effectively manage operating costs going forward. Underground development costs have been further minimized by generating a mine plan that takes a “top-down” development approach, particularly in the early years, that re-invests cash flow into mine development. To minimize mining dilution, sublevel spacing in the mine plan has been designed in a conservative manner. The mine plan will continue to be optimized based on real time operating results. 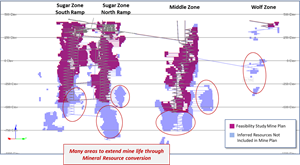 The mine plan can support a higher throughput mining scenario of 1,200 tonnes per day in 2022 after sufficient development to mine the Sugar Zone North, Sugar Zone South and the Middle Zone concurrently. The process plant was initially designed to produce a rougher flotation concentrate that is transported to the Horne Smelter in Rouyn, QC for further processing. A trade-off study on the addition of a cyanide circuit to leach flotation concentrate concluded the concentrate leaches well, which could increase production and negate the requirement to process the concentrate off site. Through additional infill drilling and sill development, there is potential to convert a portion of the Inferred Mineral Resources to the Indicated Mineral Resources category. Mineral Resource conversion will have a significant impact on areas near the current mine plan, by extending zones at depth, on strike and parallel to existing mineralization. While there is no certainty that Inferred Mineral Resources will be converted to Mineral Reserves, the Sugar Zone Mine has many such areas to be explored. Historically, infill drilling has successfully converted lower grade Inferred Mineral Resources to higher grade Indicated Mineral Resources. The Mineral Resource Estimate completed February 20, 2019 forms the basis of the Feasibility Study. A database of 683 drill holes totaling 258,605 metres forms the basis of the Mineral Resource Estimate. The Mineral Resource Estimate incorporates mineralization from the Sugar, Middle and Wolf Zones. (5) Advanced exploration bulk sample and commercial production mined-out areas were depleted from the Mineral Resource model. The mine plan is based on a Probable Mineral Reserve of 890,000 ounces grading 7.1 g/t Au. The cut-off grade of 4.4 g/t Au was determined for a mining rate of 800 tpd at estimated costs of $98/t mining, $40/t processed, $34.5/t G&A and $2/t sustaining services, plus $46/t capital development costs, and a foreign exchange rate of US$0.77 = CAD$1.00. 1) The Mineral Reserve Estimate is based on a gold price of US$1,300/oz, with 94.4% processing recovery, and a cut-off grade of 4.4 g/t Au. 2) The Mineral Reserves in this Technical Report were estimated using the Canadian Institute of Mining, Metallurgy and Petroleum (CIM), CIM Standards on Mineral Resources and Reserves, Definitions and Guidelines prepared by the CIM Standing Committee on Reserve Definitions and adopted by the CIM Council. 3) Bulk sample and commercial production mined-out areas were depleted from the Mineral Reserve. The Sugar Zone North and South ramp area stopes are targeted first, to maximize near-term production and minimize pre-production development costs. A level-by-level, bottom up stope sequencing was applied to the stopes within each mining block. 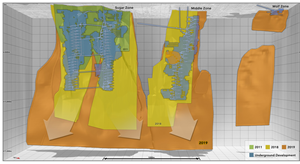 Sugar Zone stope designs are based on 15 m levels, 40 m lengths and assume 45% mining dilution. Middle Zone stope design is based on 20 m levels, 25 m lengths and factoring in 28% dilution. The average mining dilution for all mining areas combined is estimated at 38%. Longitudinal longhole retreat stoping was selected as an appropriate mining method based on the favourable geometry, current geotechnical knowledge and the success of the 70,000 tonne Bulk Sample and 30,000 tonne Phase I production mining. Both the mineralized material and the host rock are sufficiently competent to facilitate the void sizes required for effective longitudinal longhole retreat stoping. Paste backfill will be the primary stope fill type. Typically, four to five levels will be combined to form a mining block. Subdivision of the mine into mining blocks increases the number of mining faces available, thereby increasing reliability and flexibility of production. Within each mining block a bottom-up stoping sequence will be used with mining commencing on the lowest level and progressing upwards. The mine design is based on ramp development from surface to access the mine workings and production levels. Ramp development will extend down from both the existing Sugar Zone North Ramp and the Sugar Zone South Ramp. 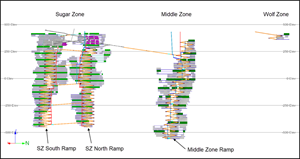 The Sugar Zone requires two ramps for access due to the large strike extent (up to 650 m), while single ramp access is sufficient for mining the Middle Zone. Mining equipment consists of one-boom and two-boom drill jumbos, longhole drills, 40 t diesel trucks, 1.8, 2.5 and 4.5 m3LHDs, rockbolter, scissorlifts, grader and ancillary equipment. Construction of the process plant was completed in 2018. The plant produces both a gold doré bar and a gold concentrate through gravity concentration and flotation circuits respectively. The process plant was commissioned at 575 tpd and has a nameplate capacity of 800 tpd. The paste backfill plant has been constructed to meet underground mining backfill requirements and to provide tailings dewatering and distribution for the tailings management facility. Each paste backfill batch is loaded into a ready-mix truck and delivered to the paste portal. The paste backfill is subsequently fed to the underground mine via a gravity pipeline. Over the life of mine, a total of 849,000 ounces will be recovered at an average head grade of 7.1 g/t Au. Effective March 31, 2019, all capital expenditures for process plant construction and related site infrastructure have been spent. The largest sustaining capital item is future underground development costs. Other sustaining capital items include mine ventilation infrastructure, tailings expansion (years 2021 and 2029) and other sustaining costs for process plant infrastructure and maintenance. Harte Gold is Ontario’s newest gold producer through its wholly owned Sugar Zone Mine in White River Ontario. Using a 3 g/t gold cut-off, the NI 43-101 compliant Mineral Resource Estimate dated February 19, 2019 contains an Indicated Mineral Resource of 4,243,000 tonnes grading 8.12 g/t Au with 1,108,000 ounces contained gold and an Inferred Mineral Resource of 2,954,000 tonnes, grading 5.88 g/t Au with 558,000 ounces contained gold. Exploration continues on the Sugar Zone Property, which encompasses 79,335 hectares covering a significant greenstone belt.